Through the Rubberbanditz mobile gym and individually sold resistance bands, Rubberbanditz has created an exercise option that works for YOU, for those who want an inexpensive and effective workout that can be completed anywhere and anytime. Rubberbanditz are safer and easier on your joints than traditional weights. They enhance normal body movements instead of isolating one muscle at a time. In essence, the bands’ elastic properties are a perfect complement to the way your muscles naturally work. Our exercise methodology is rooted in weight room principles. So, you can perform the same strength training and toning exercises with our elastic bands, only at your convenience and for less than the cost of one monthly gym membership fee. Resistance bands have gained popularity in the fitness world during the last decade as researchers began to uncover their benefits over traditional weight training. The American College of Sports Medicine, the governing body for exercise in the United States, has included resistance training in its recommendation for personal fitness since 1998. Similar to weight training, resistance band training is designed to increase and tone muscle mass. Unlike free weights, elastic bands do not create momentum. Momentum is the culprit of many injuries – the weight keeps moving, but the ligaments and tendons do not. Free weights are bound by the law of gravity and therefore only supply a downward force; over time this takes a toll on your joints. The resistance offered by the bands is created through their elasticity, generating a force from a variety of angles that strengthens your muscles while liberating your joints from the downward force of gravity. You muscles operate in a similar manner to the bands. As you contract your muscles, they become shorter and more powerful. The bands operate much in the same way; the tension increases the more you stretch them, offering a continuum of resistance. Once the band is stretched—when your muscles are contracted—the force of the resistance you are opposing is greatest. Hence, resistance bands are a perfect complement to the way your muscles naturally work. 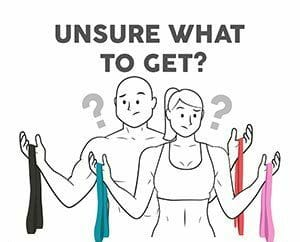 Elastic bands provide variable isotonic exercises, meaning the resistance gradually changes throughout the range of motion. So, in addition to being safer and easier on your joints than traditional weights, the bands are arguably more effective at customizing each exercise as well. Our resistance band techniques are geared towards functional training, which enhances normal body movements instead of isolating one muscle at a time. With the guidance of our visual manual and self-guided tutorials, you will be able to follow one of our certified fitness routines or customize your own personal workout. Our user-friendly training materials will assist you in: strength training, bodyweight management, core strengthening/stabilization and stretching.